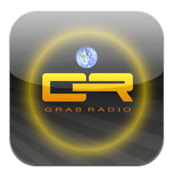 Grab Radio World: Grab It Now! Maybe I’m showing my age, but it will never not be cool to me just how easily we can listen to music from all around the globe. I remember sitting in my bedroom late at night as a pre-teen, slowly turning the dials and trying to get a signal from one of the big stations in Boston, which would come in only faintly, and never if it was raining. If I couldn’t get that, there were maybe only 2 or 3 other radio stations I could get a bead on in my remote corner of New England. These days, with a combination of the Internet and mobile apps, finding new music (or old favorites) it easier than ever. 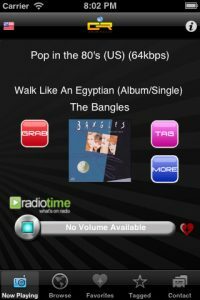 Out of the pack of many streaming radio apps, Grab Radio World distinguishes itself with a massive library, solid interface, and surprising array of streaming options. You might balk at the two-dollar price tag, and not without cause. The categories listed are a little cumbersome and too broad, and it does take some delving to bring up just the right channel to suit your mood. But if you love music, particularly music from far-flung countries, then there’s no reason you would ever dislike this relatively snappy little app offering. Readers from abroad may be familiar with this app for a good reason: it was one the few projects to get investment offers on RTE Dragon’s Den in 2010. 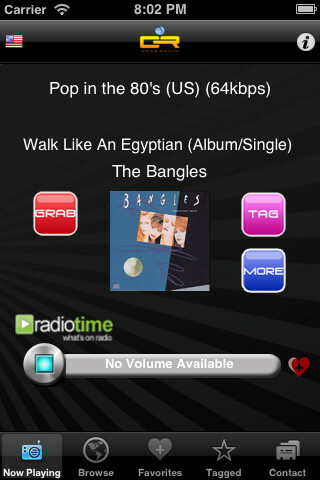 You get instant access to 40,000 radio stations worldwide without having to download separate radio station apps. There’s also iTunes and Shazam integration to help to learn the names of cool new songs, and also help you to buy them with ease. You can bookmark songs to listen to them later, and there’s a handy “auto-restart” feature as well as fairly good buffering. Best of all, if you’re using an Apple TV as your home media center, Grab Radio World plays nice with AirPlay. It’s got a clunky name, but this is a great app still worth investing in.